I’m working on a Docker Swarm deployment to production and these are some of my thoughts on how things should be. In my case the deployment is on AWS but I’m deliberately skipping the AWS-specific parts on this blog post. A service can have multiple replicas and Docker will distribute them evenly across your nodes - if you have 3 (active) nodes and a service with 3 replicas, each node will have a running instance of that service. For my very basic setup I created an encrypted overlay network for - initially - all my services. Of course you can create specific networks for groups of services but that will depend on your requirements and use cases. By default Docker Swarm configures DNS service discovery for you so you will be able to access from a service to another service in your swarm via its name, if they share the same network. In my case, I configured a private - HTTP only - registry to serve my Docker images (see Configuring a local Docker Registry). Since it wont be public and I only need it available in the virtual network of my instances I don’t see any reason why I should configure TLS on it. It’s very important to have redundancy of managers in your swarm because if you have only one manager and something goes wrong, you will lose the entire swarm. That being said, it’s also important to have an odd number of managers due to the nature of the algorithm that Swarm uses to choose their leader (read more in this section). You should also consistently backup the swarm state. Ideally you will count with two autoscalling groups, one for your managers and another one for your nodes. 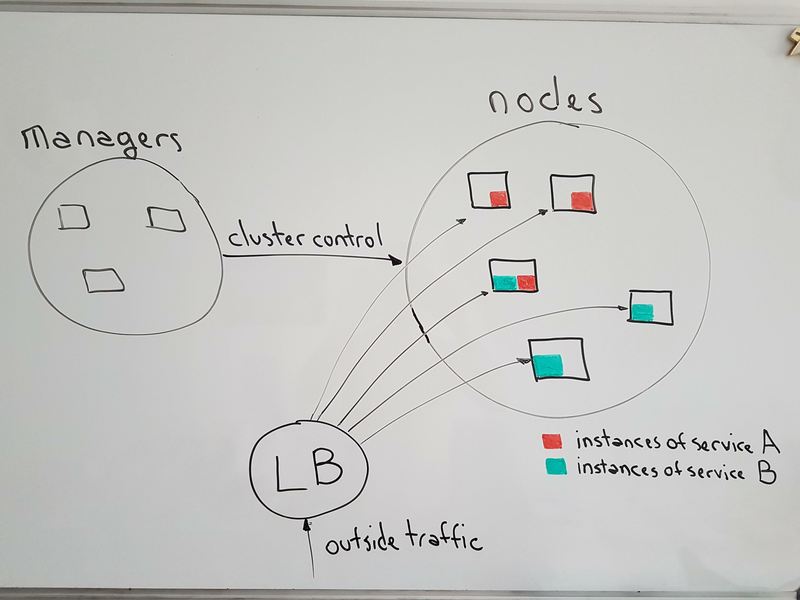 For small clusters I see no problem on letting the managers run service’s instances but in big clusters you should have only dedicated managers - see how to do it here. This blog post focus on architecture decisions but definitely the development and deployment pipelines are two other important parts that are missing. I may write something once I’m more familiar with them. If you have configured your swarm in a different way or I’m missing some neat features tell me in the comments! Thanks to Martin and Ezequiel for reviewing this post and helping me to tune up the diagram.